What’s Happening with the Ford Mustang Hybrid? Modern hybrids are often more powerful than their gasoline-only counterparts, thanks to the additional torque gained from the electric motors. This benefit is why Ford is planning to release a 2020 Ford Mustang Hybrid. 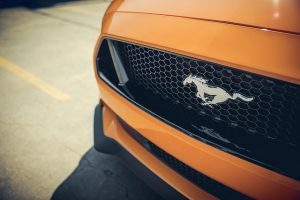 While we don’t know much about this planned Mustang hybrid, it is fun to imagine the power you could get from the combination of the 2.3-liter EcoBoost turbo, a 10-speed automatic transmission, and a pair of electric motors. With this powertrain blend, we will likely see an output of at least 400 horsepower and 400 lb-ft of torque. It is possible that Ford will utilize the same hybrid technology it is planning for the next-generation Ford Focus RS. Industry reports indicate that the Focus RS Hybrid will use a 48-volt starter system that will boost its output to around 400 horsepower and cut about 0.4 seconds off of its current 0-60 mph time. Along with its improved output, the Mustang Hybrid should see a boost in efficiency, too. While fuel economy isn’t expected to go up significantly, it should at least boast a better rating than the gasoline-only models. Stop by Tropical Ford to find out more information about the upcoming 2020 Mustang Hybrid. You can also take your favorite Ford model for a test drive. Posted on June 1, 2018 May 31, 2018 Categories Hybrid, MustangTags hybrid, MustangLeave a comment on What’s Happening with the Ford Mustang Hybrid?